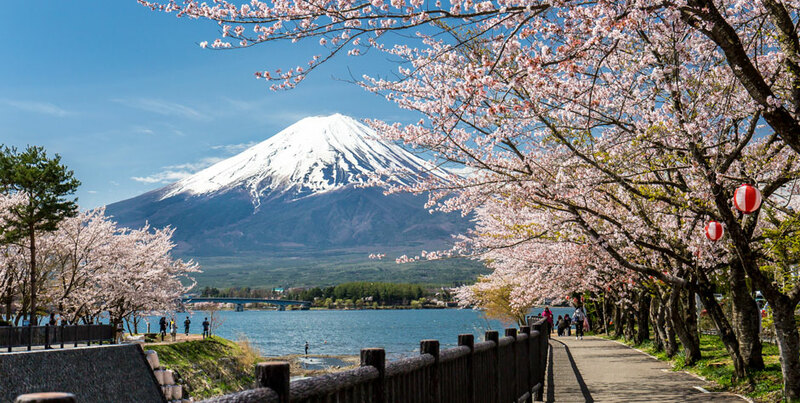 Follow the cherry blossom trail as it blooms across Kyoto, Kanazawa, Nikko and Tokyo on a 14 day tour that takes you inside Japan’s great gardens. Experience a fascinating mix of ancient Zen serenity and modernity that makes Japan such an exciting cultural destination. Meet at Sydney Airport for a Qantas evening flight to Tokyo. 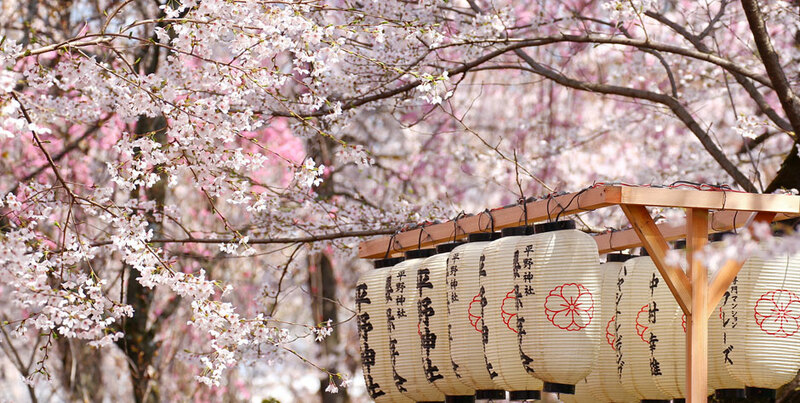 On arrival at Tokyo, we’ll take the bullet train for Kyoto, the beautiful former imperial capital of Japan. Our first garden visit on tour is Heian Shrine, with its unique pairing of Chinese and Japanese architectural styles. 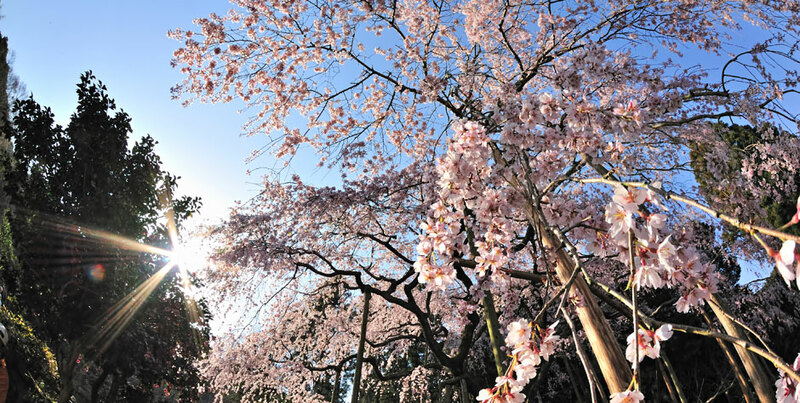 The entrance to this popular Meiji-era strolling garden is through an avenue of 300 weeping flowering cherries. It’s a popular venue for wedding parties, and we can expect to see brides in exquisite bridal kimono posing for photographs. Welcome lunch included today. Legend has it that Ginkakuji – the Silver pavilion – was to be covered in silver leaf, but the shogun died before that could happen. An alternative theory for the name holds that the glistening black tiles on the pavilion roof reflected the light of the full moon in such a way as to look like silver. We’ll come to our own conclusion as we admire the elegance of the pavilion and the wonderful Zen gardens with their raked and moulded gravel. This serene garden also features ancient pines, ginkgoes, maples and camellias. Our next stop is Hakusa Sonso, a garden, villa and museum created by the famous Japanese painter Kansetsu Hashimoto in 1915. We’ll watch a tea ceremony performed by his wife, a Tea Master. The garden is a showcase of Japanese plants and Chinese statuary and we’ll have plenty of time to admire it. Later we enjoy lunch at the family’s restaurant. 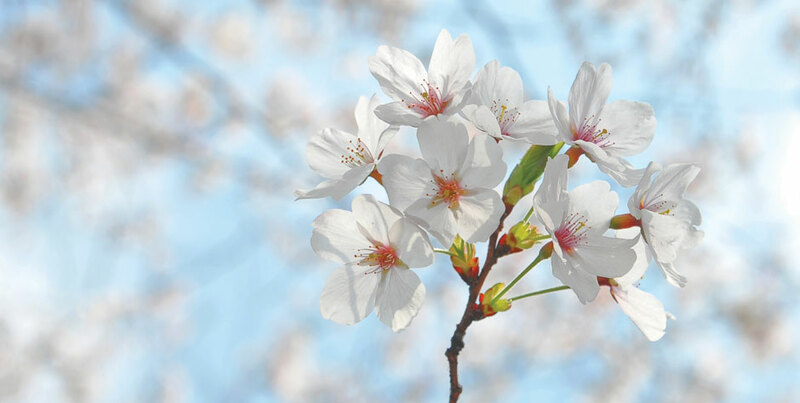 We’ll stroll along the famous Philosopher’s Path this afternoon, under thousands of cherry trees in full bloom and perfumed spring flowering shrubs, and with the rushing snow-fed waters of the Shirakawa River below us. Three rows of cherries line this most-admired walk, which stretches from the local temple to the entrance of the Silver Pavilion, Ginkaku-ji. We’ll experience iconic Japanese garden design today. First, an early start to catch the wonderful morning light glowing on the 18-carat gold leaf-covered roof of the Golden Pavilion, Kinkaku-ji. Shogun Ashikaga Yoshimitsu built this three-tiered pavilion in 1397. He used it for entertaining, and as a space for quiet contemplation of nature. Its perfect proportions are reflected in the broad Mirror Lake before it. Ryoanji Temple is our next stop, renowned throughout the world as Japan’s finest example of a rock and sand garden (seki-taki). We’ll take time here to reflect on the meaning of the raked patterns and enigmatic placement of rocks. 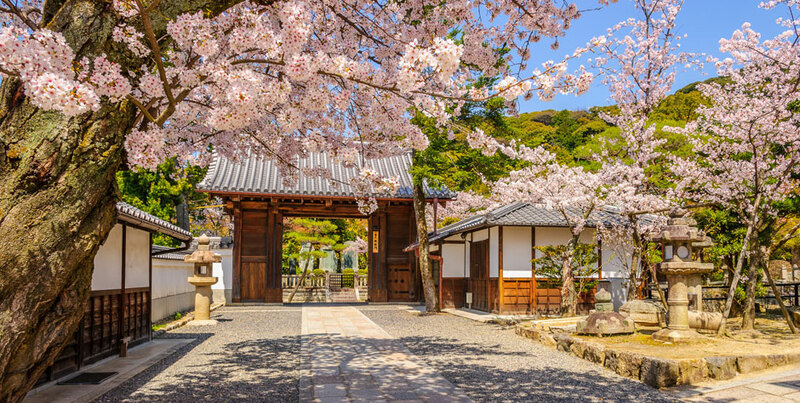 While this stone garden is the most famous part of the temple grounds, the garden itself is large and planted with Japanese cedars and hundreds of exquisite flowering cherries. It’s also home to a stone water-basin, Tsukubai, engraved with a famous Zen script. After lunch visit Gioji Temple, a small thatched roof hall surrounded by a luxuriant moss garden. 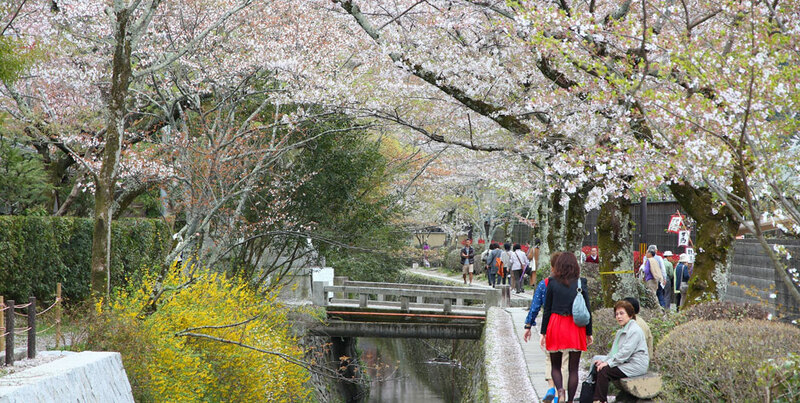 Finish the day at Arashiyama with a walk through a dense bamboo forest. It’s an early start at Kyoto’s eastern Higashiyama Mountains to wonder at the towering, World Heritage listed, Kiyomizu Temple. Our next stop is Nijo Castle, famous for its fortress-like interior and the ingenious escape routes built into the design by the Tokugawa shogunate in the early 17th century. The garden here, Ninomaru Garden, is planted with ancient pine trees and 430 ‘Sakura’ cherry trees. We’ve arranged a very special dinner tonight with an elegant geisha/meiko traditional dance performance. Travel by bullet train to Nagoya to visit the iconic Nagoya Castle. This afternoon visit Nabana No Sato in Mie prefecture. This theme park is a new concept in world-class show gardens covering many hectares with beds filled with thousands of every type of spring flower possible and huge glasshouses overflowing with tuberous begonias and more hanging baskets than you could count. After dark enjoy one of Japan’s largest illumination shows. Express train north this morning, through Japan’s picturesque countryside to Kanazawa on the Sea of Japan. Kanazawa is a lovely change of pace where traditional crafts, such as ceramic, embroidery and gold leaf work are still practiced. Next we visit Nomura Samurai house with a garden of meandering streams, waterfalls, lanterns and plants. Today we visit Kenroku-en Gardens which combines the six essential features of true gardens: vastness, symmetry, solemnity, coolness, antiquity and pleasure. This is one of Japan’s three most famous landscapes and was developed from the 1620’s by the local daimyo Lord Maeda and includes Japan’s oldest fountain operating by natural water pressure. Included is a visit to Seisonkaku Villa, built by a samurai for his mother. A once in a lifetime experience today, as we travel deep into the Japan Alps to visit Shirakawago Village. This village, nestled in a rural setting that looks unchanged for centuries, was listed as a UNESCO World Heritage Site in 1995. 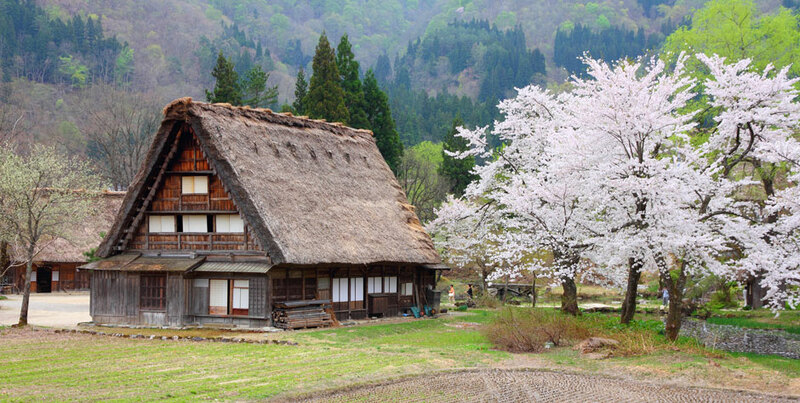 The traditional farmhouses have steep thatched roofs, called Gasho Zukuri, a style used more than 250 years ago. We’ll stay tonight in a Japanese ryokan, and enjoy a traditional Japanese style kaiseki dinner. Make sure you take time to enjoy the very special hot Japanese baths at the ryokan. Travel by train from Komatsu via Kanazawa to Takasaki and make our way to Nikko National Park and its famous monuments and mountains. We’ll travel up the northern coastline, then cross the spine of Honshu through forests of Japanese Cryptomeria cedar and Chamaecyparis cypress dotted with maples. On arrival at Nikko, we visit the former Imperial Summer Palace – the Tamozawa Imperial Villa for a walk around its beautiful garden. Our hotel in Nikko for the next two nights is the charming, 145-year-old Nikko Kanaya Hotel. This is the oldest Western-style hotel in Japan and many diplomats and intellectuals used it in its 19th and early 20th-century heyday to escape the summer heat of Tokyo. Fittingly, dinner tonight in the hotel is western-style, complete with silver service. We’ll take a walking tour of the nearby Toshogu Shrine today, and hear the history behind this sacred region and its traditions. The shrine was built in 1542 to honour the founder of the Tokugawa shogunate. Rinnoji Temple, on the avenue leading to the shrine, contains three gigantic gilded wooden images of Buddha. The buildings are inspiring, but it is the natural beauty of the place that drew the rich and powerful all those centuries ago, and it still casts a spell. There are giant cryptomerias over 1000 years old, the turbulent waters of the Daiya River, and mists wrapping the mountain. The entire site is World Heritage listed. Afterwards, we visit the impressive red Sacred Bridge. 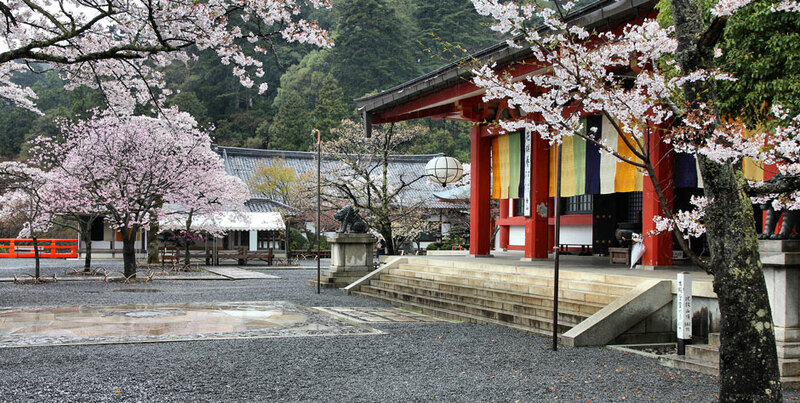 This afternoon there is plenty of time to explore the charming town of Nikko and soak up the tranquil atmosphere. Late check out included today, so our day is free to explore some more of Tokyo. Stroll through the famous Ginza district, visit Hibiya Park, or catch up with some last-minute shopping. We’ll take an early evening transfer to Haneda Airport for our overnight flight home. Book and pay in full by 1/11/2018 to receive the Early Bird Discount of $300.00 per person off the final instalment. Read what our tour leaders have written about Japan here.